For many years undina@myway.com was my main address for everything blog- and perfume-related. It was an OK service – if not to count that some of the providers were blocking it from time to time, that it went down for several days around New Year or that it was impossible to check e-mail from a mobile device. But I got used to it; I used it for all registrations, subscriptions and to communicate with my friends in perfumes. Not being big on changes, I would have continued tolerating all its quirks but it has been decided for me. As of October 2, 2017, MyWay Email will be shut down. If you are a MyWay Email account holder, please log in and save all information you wish to save. After October 2, 2017, you will not be able to access your emails. Well… I kept postponing it for as long as I could but from September I started moving everything I could think of to my new address. I think I’m mostly done. The last steps in my plan – to let know about my address change to all of you, here on my blog and in direct e-mails that will follow in the next week. 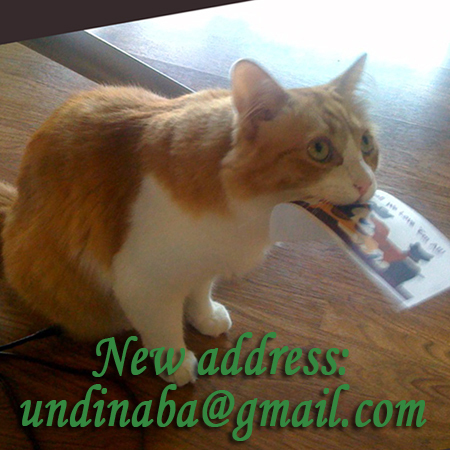 So, if you have a strict spam policy in your inbox, please add my new address to your address book. I’ve got a funny feeling that YOU put that card in Rusty’s mouth …….. I did not, I swear! :) He stole it from the counter and brought to me. I asked him: “Are you trying to tell me something?” But I was sure that he didn’t mean to remind me about the trip to the vet. Ah, so maybe he was about to eat the evidence, hoping you would never know about the reminder????? What a pain to have to switch, but then again, it’s a good way to get rid of unwanted subscriptions. My only regret when I decided to stop using my aol account was that my AppleID, which used to require an email aggress as the username, ended up getting stuck as is although I was able to change my associated email. Here’s hoping everything goes smoothly. See you on the other side! I still have a problem with my Apple ID: somewhere in an unknown place it has stored my original e-mail (from the previous job); and though I seem to manage the change in all the places I could think of, it re-appears from time to time in unexpected places, and I have to figure out every time how to deal with that. Annoying! Rusty must have a capacious mouth, is what ran through my mind! Hope the move goes smoothly for you. I’ll try to download my e-mails for the last seven years but I’m not sure if it works – I’ll know soon.